It is the maximum stress that the sheet metal material is subjected to before pulling out. The unit is: N/mm2 or MPa, the symbol is σb. It is one of the indexes of metal strength. 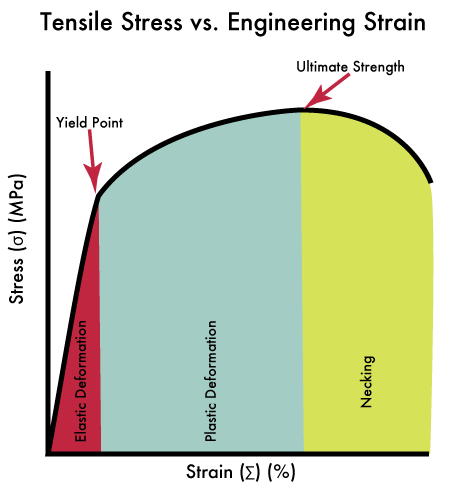 It is the maximum stress that the cross section is subjected to when the load is applied between the two points of the specimen. The unit is: N/mm2 or MPa, the symbol is σbb. It is one of the indexes of mental strength. It is the maximum stress that the sheet metal material can withstand under pressure without breaking. The units are: N/mm2 or MPa, the symbol is σbc. 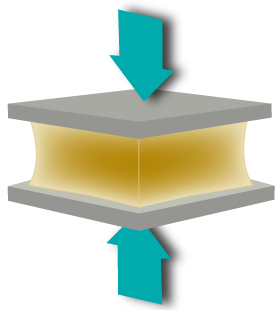 It refers to the stress of the metal sample during the stretching process, when the load no longer increases and the sample continues to deform. The unit is: N/mm2 or MPa symbol is σs. 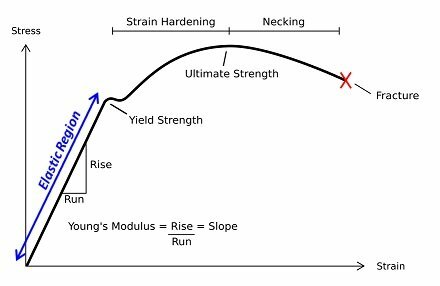 The yield strength is the pressure value of the yield point. 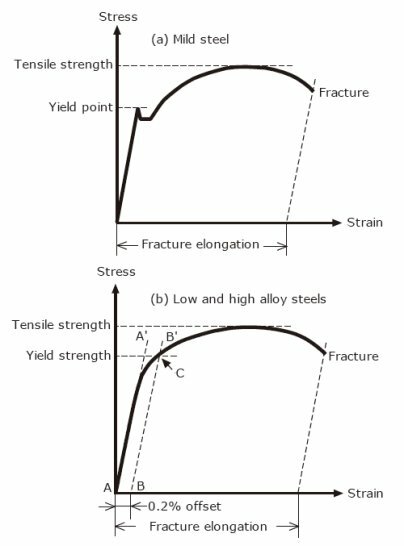 For the material that is not obvious yield, the stress value that produces 0.2% permanent deformation is often referred to as the yield strength. It refers to the maximum load of the original cross-sectional area of the shear area before the sample shears. The unit is: N/mm2 or MPa and symbol is στ. It refers to the maximum stress of the specimen under the condition that the test piece deforms after the external force disappears and can recover the original condition. The unit is: N/mm2 or MPa and symbol is σe. It is the percentage of the original cross-sectional area that is shrunk after tensile load. The symbol is ψ and it is one of the plastic indexes of materials. Refers to the percentage of the elongation of the sample material and the original length after the sample material is breaking. Elongation is also one of the plastic pointers of materials and symbol is δ. 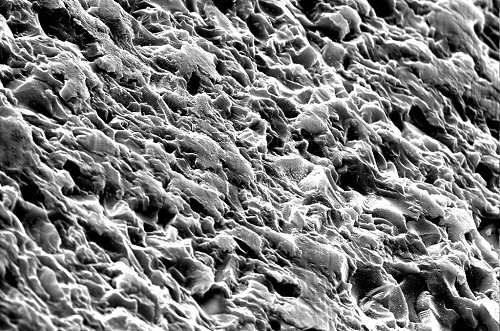 It refers to the ability of the material to resist hard pressing into its surface. There are three types of hardness: Brinell hardness, Rockwell hardness and Vickers hardness. Generally, the hardness of steel increases with the increase of carbon content in steel. 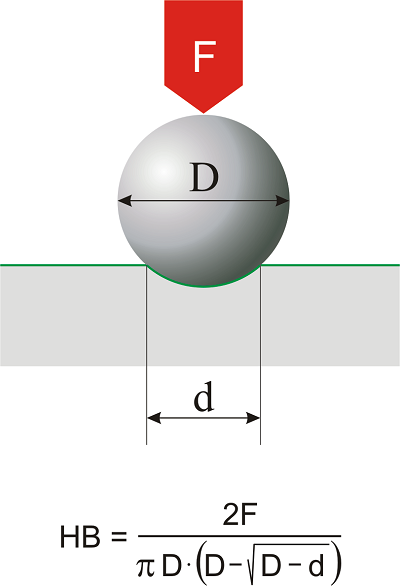 press the steel ball after quenching into the material surface and keep a period of time under specified load, then calculate the ratio of pressure load and area of indentation. The ratio is the Brinell hardness. Press the diamond cone or steel ball after quenching into the sample material surface, then measure the material’s hardness according to the depth of the indentation. 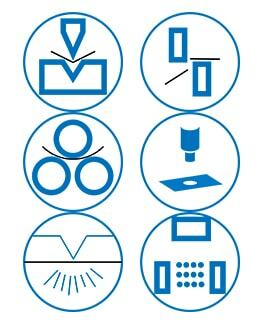 The Rockwell Hardness can be divided into HRA, HRB, HRC based on different test items and pressure. The hardness was obtained by applying 1470N pressure at a diamond head with a cone angle of 120 degrees on the test samples. Suitable for measuring surface quenching layer, carburizing layer and hard alloy material. It is the hardness value obtained by applying 980N pressure to the steel ball with a diameter of 1.59mm. It is suitable for measuring soft metals such as nonferrous metals, annealing, and normalizing steel. 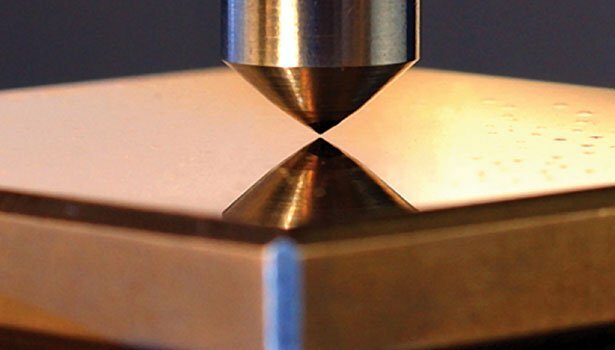 The hardness was obtained by applying 588N pressure at the diamond cone with 120° vertex angle for testing samples. It is suitable for measuring hard metal such as tempered steel and hardened steel. Good to have all your information in my recorders and to share all these with my budding junior engineers. Email me all such related information of Mechanical Engineering. Your small action are big big information to all engineers out here. Thank you. I believe to keep our website site address in your mind is better, why not share our site with your engineers.